Soaks up water like a sponge! 18 oz. per sq. yard plush cut pile. Vinyl backing is impervious to dampness and will not shrink. Perfect for indoor entrances with heavy traffic. Easy to clean. SPECIFY COLOR: BK - Black, BL - Med. Blue, BR - Med. Brown, CH - Charcoal RD - Red. PRE-CUT SIZES IN STOCK. Others FOB TENNESSEE. 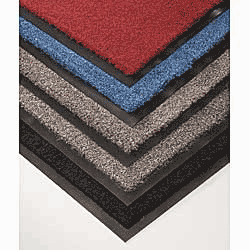 Custom Cut Mats: Mats are 36" or 48" wide by up to 60 feet long. Quantity represents W" x 12"